The NBA is headed for a jam-packed weekend of basketball action. The 2017-18 season is past the halfway mark, and several teams need to start picking up their play now, if they hope to make the NBA Playoffs. Daily fantasy sports players have some big decisions when it comes to matchups and players for this weekend's games. Which players should every NBA daily fantasy sports player have in their teams this weekend? Letsrumbl has the answers. LeBron James takes the Eastern Conference's third best team, the Cleveland Cavaliers, up against the Indiana Pacers. James is coming off another career milestone this week as he scored his 30,000th point on Tuesday night. Despite the career highpoint, Cleveland lost its 19th game of the season against the San Antonio Spurs. James has been unable to save the Cavs this season, and the team looks less like the Cleveland everyone has come to know. On January 12th, the Cavs gave up a 22-point lead in a losing effort to Indiana. It was a shocking loss to say the least. That said, Cleveland is 16-6 at home this season. James averages a team high 26.8 points per game and 8.6 assists. Despite three losses to the Pacers this season already, James has played well against them. In the Cavs last game against Indiana, James played over 40 minutes and scored 27 points. He added 11 assists to go along with being high-point man. The Pacers had few answers, but were able to shutdown James' teammates. Don't expect them to stop James on Friday night as he picks up the slack for the rest of the Cavs. Karl-Anthony Towns is ready for a big night against the Brooklyn Nets on Saturday. The 2016 Rookie of the Year averages 20 points a game for the high-flying Minnesota Timberwolves. The Nets are third from the bottom of the NBA's Eastern Conference, and the team is giving up 108.6 ppg; which is sixth worst in the Association. Towns is second on the Timberwolves in scoring, and he has benefitted from Jimmy Butler and Jeff Teague this season. The two players are able to draw defensive players away from Towns, allowing him to score buckets down low. The Nets are being out rebounded each game and Towns should clean up on the glass. He averages 12.1 total rebounds a game. Towns' teammates Jamal Crawford and Jimmy Butler are set to miss out on Wednesday night's game against the Portland Trail Blazers. The two could be back and well rested for Saturday's game. Their inclusion can help open up space on the court for Towns. 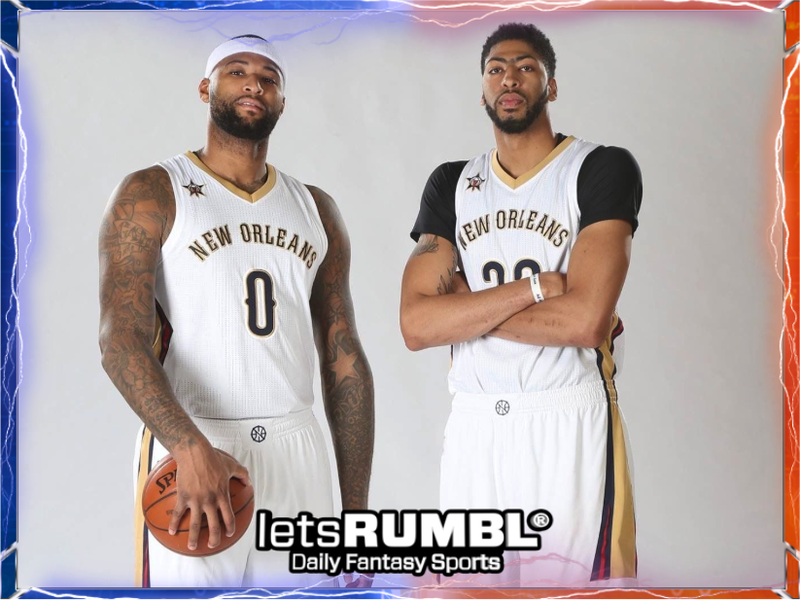 New Orleans Pelicans players DeMarcus Cousins and Anthony Davis are hot right now. The Pelicans have won two straight games as of January 24th, and against the Los Angeles Clippers on Sunday, New Orleans can keep its winning ways going. Cousins averages 25.6 ppg. His last two games have been out of this world, as Cousins averaged 34 points against the Memphis Grizzlies and the Chicago Bulls. Against Chicago in particular, Cousins played over 51 minutes of the game. The last time the Pelicans played the Clippers, Cousins tallied 35 points and 37:10 in a New Orleans win. Davis is New Orleans top scorer in 2017-18 with 26.7 ppg. Just like Cousins, Davis had a fantastic outing against the Bulls with 34 points in 42:47. Davis added nine rebounds and five assists to his stats line in the Pelicans win. Davis scored 25 points the last time the two teams met. Davis has scored 30 or more points in four of his last six games. He is red hot, and his latest Letsrumbl points total of 50 reflects his great play. The combination of Cousins and Davis could mean massive fantasy points for players as the Pelicans look to continue their hot streak.